Are you looking for Cruise line jobs? Here we provide some actionable tips. A lot of hospitality professionals are not aware of how to apply for cruise line jobs. In this post, we have outlined methods that would help you apply for cruise ship jobs. Lots of people look upon Cruise Line jobs as adventurous and exotic. If you are a looking for a job on cruise ships, then you are not alone. Even those people who are too young to remember “The Love Boat”, it looks like great as well as an interesting job. Moreover, it is also extremely well paid. 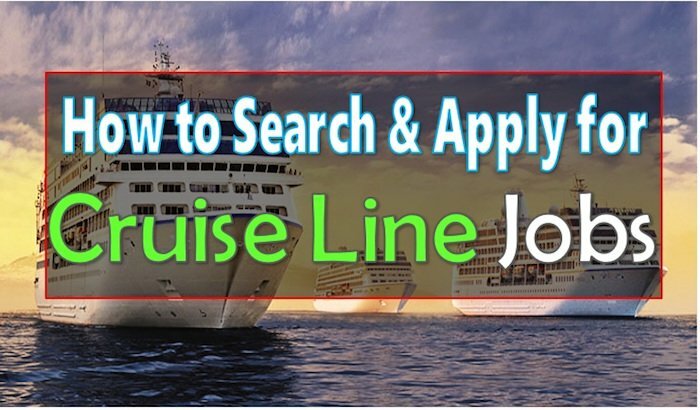 In this post, we will cover the basics of cruise line jobs and provide you with ample resource and links to explore Cruise ship jobs further. What are Cruise Lines and what are the types of jobs available? How cruise lines hire team members? How can you get selected for a Cruise line? While we have outlined a lot of cool tips here, there are professionals who help in order to make the task easy. But, we have made efforts to ensure you have the right guidance and information to land your dream cruise jobs. 1. What types of jobs are available on cruises? Cruise line jobs constitute a key segment whenever we discuss the career paths in the hospitality industry. Cruise ships are just like floating resorts, a complete team at sea. Whether you have just seen Love Boat, Titanic or you just returned from a cruise trip, you know very well what the cruise vacation is all about. With increasing developments in this sector of the hospitality industry, more and more companies are launching cruises. You must be aware of the details of Cruise ship jobs to know how to apply for Cruise ship jobs. Marine Operations Division: In this division, people are required to manage the operations of the cruise. It mainly includes sailing operations and engineering tasks which help the cruise float smoothly. Know more about it at the Royal Caribbean’s page for Details about Marine operations division. Guest Service Operations Division: Guest operation division deals with hotel management, food management, and guest handling services to make the time of people more worthwhile. It is this division which is visible to the guests. It is fun, service and entertainment. By landing a job with any cruise line you can get the best of both world’s; travel, adventure and a steady Paycheck. Did you know that there are over 300 types of jobs on these ships plus lots of wonderful opportunities at cruise line headquarters around the world? Here you can have a look at various types of jobs on Cruise ships. Just imagine yourself travelling to such places in the world you have always dreamt of and then getting paid for it. Cruise ship jobs are not for everyone. One of our other posts discusses in details the Pros and cons of Working on Cruise ships. 2. How Cruise Lines Hire New Workers? 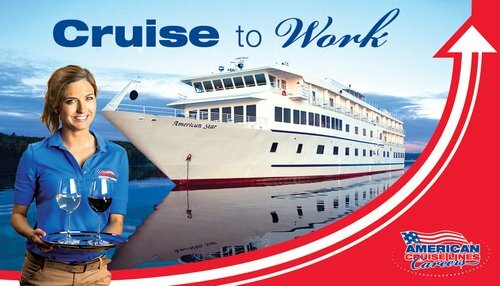 Cruise jobs are extremely suitable for those who have a passion and a drive to work on Cruise ships. Can be Students, Retires, and career changers. In order to answer how to apply for Cruise line jobs, it is equally important to know the process of hiring at cruise ships. The hiring process is not as simple as of hotel industry and Cruise ship jobs are not actively advertised on social media platforms and job portals. Cruise companies always hire such peoples who have experience in, tourism, hospitality, entertainment, Bars & restaurants, childcare, sales, teaching, gaming, customer realities, fitness, beauty, health, Healthcare & medicines, and financial management. If you want to work in cruise ship line then your number 1 priority as a cruise line worker is to provide a fun, safe as well as a memorable vacation experience to customers. Cruise companies always hire dependable competent workers with positive and outgoing attitudes. They do follow due diligence but mostly communication, personality and passion outweigh experience and knowledge. 3. How can I get hired at a Cruise Line? If you have a nudge for adventure and fun then travelling on a cruise could be the best thing you could do. The problem is that not all of us can afford a luxury trip on an expensive cruise. So, the solution is to get a job on the board. Yes, applying for a job on a cruise could help you fulfil your dream of travelling on a cruise. Getting a job on board isn’t easy as companies look to hire the best in the lot. This needs you to do your homework to ensure your resume climbs to the top of the pile when hiring starts. First of all, you need to know about the best cruise lines companies and you will easily find the cruise lines most likely to hire you. Which are the best cruise lines? Look at the career sites of Cruise liners for best Cruise line jobs. 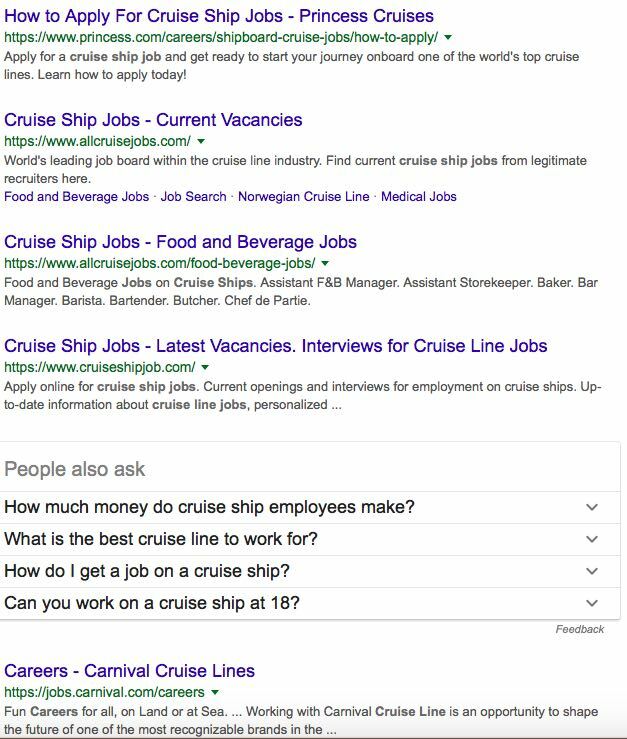 Just do a Google search and you would find a lot of authentic options to apply for cruise jobs. You would be elated to know that most of these would be direct. This is what came up with when we made a Google search and you can do this too rather than opting to pay some unnamed consultancy. Also, do research on who is adding new and latest cruise ships? Apply for the top cruise lines companies first. Familiarize yourself with your ideal company product. Where do these cruise ships travel? For what facilities are they best known for? If you are hired for the job in cruise ships, then one thing you need to keep in mind is that “your customers are your ultimate employers”. The most important thing you can do to raise the prospects of getting a job is, strengthen your resume. It makes a lot of difference in your chances of getting a job. So, tailor your resume according to the needs of the job. Most of the people miss this. The key with Cruise ship jobs is to get ahead of the pack. Write a convincing cover letter which you will submit along with your resume. The cover letter should address the reasons why you’re a perfect entity for the job you’re applying for. Make sure the Cover letter is not over 1 page in length. We have said this earlier and we will say it again. What you are selling is your own brand. So be your best when you apply. Never feel shy of applying and never apply underprepared. The Internet is the best source to apply for a job on a cruise. You can search for blogs discussing how to get a job on a cruise ship. Moreover, you can go through job portals of multiple shipping companies as well and drop your CV. There are many recruitment agencies which hire people and then provide staff to cruise services around the globe. You can affiliate yourself with one such agency in your area. Trust only the best ones and do your research before applying and a word of caution; never pay any recruitment agency until and unless it is administrative or visa charges and confirm the same with your employer. Few reliable names to search jobs in cruise ships are Seven Seas Group, Hospitality Net, CTI Group, Cost a way etc. Personal approvals serve the best purposes. If you know anyone who has already served on a cruise, interview them and ask them to guide on how to get a job on a cruise ship. Learn more about the best ways to search jobs in Cruise lines. It is equally important to discuss the benefits of a cruise job. Save Money: Food, accommodation, and medical are free, so you save a lot of money. Travel: You get to travel for free. You will enjoy your work as you will have a unique experience. Family Travel: Many high ranked jobs on cruise ships allow people to take their families along with them. One of the biggest attractiveness for cruise ship worker is the ‘Pay’. By working with cruise ships you are able to save lots of money because most of the expenses are left behind. Lodging and meals are provided to you for free. No more rent, gas, grocery or electricity bills. The above salaries are indicative and vary depending on the employers. Check the individual websites for a more accurate figure. Some more indicative salaries can be found at Cruise salaries by Payscale. Our guide on Salaries in the hospitality industry also has some resources to find more information on Cruise line job salaries. 5. What are the Requirements for Cruise Jobs? Health requirements and being able to fit the job role is the key but there are other technical requirements to go with for getting Cruise line jobs. So here are a few basic requirements that you must need to fulfil if you want to be a member of any cruise line company. Although most of the cruise lines companies hire applicants with the minimum age of 21, there are crew members on cruise ships who are able to get hired at 19 and 20 years. Unfortunately, it is extremely difficult to get hired for hospitality Cruise Line jobs if your age is more than 35 years. It is a must for the applicant to ensure that he or she is able to understand and speak English fluently if he/she wants to work in any cruise line company. Additional languages are a big advantage. Every large cruise line company requires police clearance from the applicant that would prove that the applicant doesn’t have any criminal record. Besides these, there are several other soft skills requirements for Cruise line jobs. There are a lot of other queries you might have regarding cruise ship jobs. Look at some frequently asked question in the FAQ section of Cruise Ship jobs for a detailed list of frequently asked questions about cruise line jobs. Think, prepare and act. Get your research in order and start applying. All the best! Please keep coming back to get more information on the hospitality industry and Cruise related information. We will see you around.